With a stay at North Farthing in Monkey Bay, you'll be 4.2 mi (6.7 km) from Lake Malawi National Park and 9 mi (14.6 km) from Monkey Bay Beach. Free self parking is available onsite. When you stay at Fish Eagle Bay Lodge in Nkhotakota, you'll be on the beach and 15 minutes by car from Nkhotakota Game Reserve. Free self parking is available onsite. 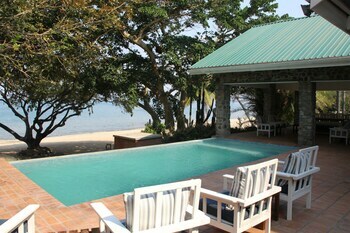 Located in Mangochi, this villa is on a lake, within a 5-minute drive of Monkey Bay Beach and Nkhudzi Bay Beach. Free self parking is available onsite.